Do you want Starbucks-style coffee without needing to leave home? If so, you’re in for a real treat today. Here at Fourth Estate, we’ve just taken delivery of our new Keurig K55. We’ve been putting it through its paces so we can serve you up with a really thorough guide to this awesome coffee maker. As well as giving you all the information you need to know if this coffee machine makes sense for you, we’ve got a treasure trove of pictures and videos to bring things to life for you. We’ll walk you through, unboxing the Keurig, preparing it for use and then pressing it into action. We chose this combination bundle which includes 40 assorted K-Cups shipped under separate cover. For a small premium, you can buy the K55 in bright red instead of the black model we chose. Both colorways come with the option of a Keurig Dash at extra cost. 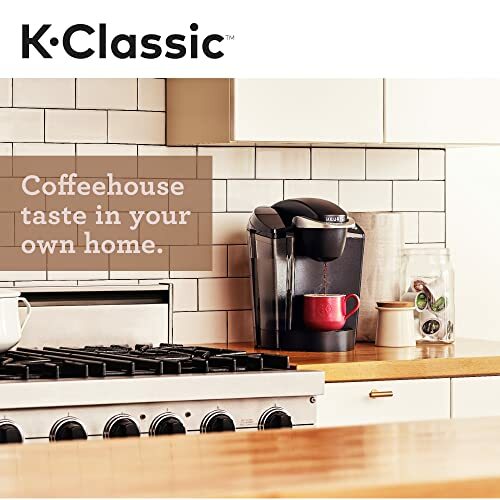 This Wi-Fi-enabled gadget orders your new K-Cups at the push of a button but we didn’t see fit to pay extra for this. Alongside an honest appraisal of where the K55 stands and fall, we’ll also give you a thorough grounding on how to get the very best from this coffee maker. The Keurig is not expensive although the K-Cups are not particularly cheap. The thing is, you should consider the price of these set against a comparable cup of coffee in one of the chains. In that context, a Keurig actually represents superb overall value for money. OK…Without further ado, we’ll move on to unboxing our new pride and joy so you can see exactly what to expect from the award-winning Keurig K55. If you opt for the same combo deal we did, you’ll get 2 boxes under separate cover. There’s a water filter handle as well as 2 filters to get you started without running to the store. Just as descaling is crucial, properly filtering the water allows you to enjoy coffee from your machine at its very best. Right there, you’ve got something to kickstart your morning, help you relax into your afternoon then wind down toward bed with a delicious hot chocolate. If you want to save some money by investing in a real bumper pack of K-Cups, you can pay a little more for this awesome pack of 96. The Keurig itself comes securely packaged. With everything nicely padded and protected, you’ll have no worries at all about any kind of damage in transit. Seriously adhesive tape makes certain the brewer itself doesn’t end up coming apart in the box. Pulling up on the lid, you can expose the removable K-Cup pod holder. The substantial 48oz water reservoir sits to the left. This also slips out for ease of filling and cleaning. This is where you pop the water filter provided. Front and center is the cup holder. This traps all surplus water and you can again pull it out for cleaning purposes. It comes apart into 2 pieces to make your life even easier when you’re wiping away excess coffee. Now you’ve got a solid overview of what comes in the box of your Keurig K55 Classic, it’s time to get down to action and start brewing! ​The Keurig runs on standard 110 or 120 volts at 60 Hz. If your power supply is 220 volts, you’ll need to invest in a transformer so bear this in mind to avoid disappointment and unexpected expense. First up, you’ll need to set up the water filter starter kit. This is straightforward but requires a little preparation. It’s a good idea to run a brewer’s rinse before getting down to business. This flushes the system through for best results. Taking the time to perform this dry run is well worthwhile. Don’t try to save 5 minutes by skipping this. 5. Now it’s time to brew your first real cup of coffee! Empty the water from your mug and replace it on the drip tray. Lift the handle and pop in your K-Cup pod. We’ll look at the mechanics of that in more detail shortly. Lower the handle and select your brew size (6oz, 8oz or 10oz) then wait for a piping hot coffee, sit back and relax! As you can see above, brewing coffee properly with your new Keurig K55 is very straightforward. Indeed, this simplicity is one of the key selling points of these single serve coffee makers. You won’t be overwhelmed with menu options like you’ll see on more expensive and intricate coffee makers. It really is as simple as pushing a few buttons and letting the machine do all the work. The first step to getting the best coffee for your personal taste is to focus on the K-Cup pod or freshly ground coffee you most enjoy. If you are worried about the cost here, try comparing it to visiting the coffee shop for a latte and it suddenly starts to seem like rather good value. Get the coffee right and that’s half the job done. Using bottled water or at least filtered water will also make a slight but important difference when it comes to the quality of the coffee in your cup. Remember: do not remove the foil lid on the K-Cup pod. When you pop this pod into your machine, there’s a metal piercing holder above that punches a hole in the top of the pod. Hot water then enters the hole and disperses over the coffee. There’s another piercing holder beneath which makes a smaller hole in the bottom of the K-Cup pod. This allows the water to follow the paper filter and then make its way into your cup. As long as you follow the simple instructions we’ve laid out above and use a coffee you really savor, brewing the perfect golden cup of your coffee with your Keurig K55 is an absolute breeze. Rather than a lengthy text review, we’re going to break down the key benefits of the Keurig K55 next in an easily digestible manner. Auto Shut-Off Functionality: Your machine will automatically power down after 2 hours to save your power bill. Now it’s time for a frank and honest appraisal of the Keurig K55’s drawbacks. After all, nobody wants to read product reviews that hide all the negatives only to result in a nasty surprise later down the line. 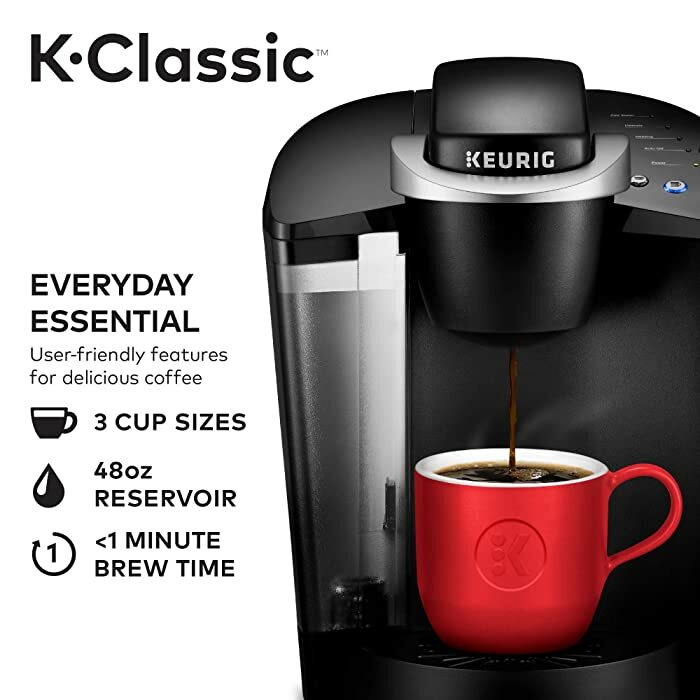 Lengthy Delay With Auto Shut-Off: The Keurig K55 shuts off automatically after 2 hours. While this is a valuable safety feature and one that can slash your power consumption, the delay is not to everyone’s taste. Indeed, some users initially thought the feature was not working at all. There’s no need to override this by manually switching your machine off unless you really want to. Be patient and it will do the job of its own accord. The purpose of the 2-hour time delay is so in the interim, the water stays heated saving you time and effort when you make your next coffee. If it powered down after 15 minutes, each coffee would take 5 minutes to make rather than less than 1 minute. As you can see, the shower of benefits with this excellent, pocket-friendly coffee maker seriously outweighs the few drawbacks. When minerals build up inside your coffee machine, this can clog things up and impair performance as well as taste. Descaling helps to get rid of this accumulation of chalky debris so should not be overlooked. Luckily, descaling your K55 is a cakewalk. You should shoot for a full descaling every 3 or 4 months. This depends on the mineral content of the water you’re using so err on the side of caution rather than pushing things to the stage where the mineral deposits get out of hand. Although you can use white vinegar, Keurig strongly recommends using commercial descaling solution. Wipe down with a damp cloth and your Keurig K55 is fully descaled and ready for action again! While you should experience no problems with your Keurig, as with any coffee machine, things can go wrong from time to time. We’ll walk you through troubleshooting 5 of the most common problems that crop up with the K55. This is a surprisingly frequent occurrence but there are some failsafe fixes. Firstly, don’t overlook the obvious. Check your machine is plugged in. We say this not to insult your intelligence but because we have done this ourselves! It’s a good idea to check the outlet by plugging in a different appliance. If all is good here, press the Power button and hold on to it. The display should light up. Make sure the water reservoir is properly attached. If the magnetic contacts are not aligned, this sometimes causes the K55 to power down. Descale your machine using the simple procedure detailed above. Clean the needles thoroughly by removing and washing them. If an individual pod is not glued down properly, the machine won’t puncture it as intended and you can end up with grounds everywhere. The needles can become clogged so clean them as above. Using anything other than a coarse grind if you opt for fresh coffee can also lead to grounds in your cup. The first line of attack should be to descale your Keurig. Clean the water reservoir and also the needles to drive away any rogue debris that might have accumulated. Take into account that Keurig’s are not quiet even when brand new and in peak condition. Mineral build-up or clogged coffee grounds can lead to even more noise. They will also make the machine work much harder which will reduce its lifespan. Always use filtered water and never use mineral water since this worsens the problem of scale building up. 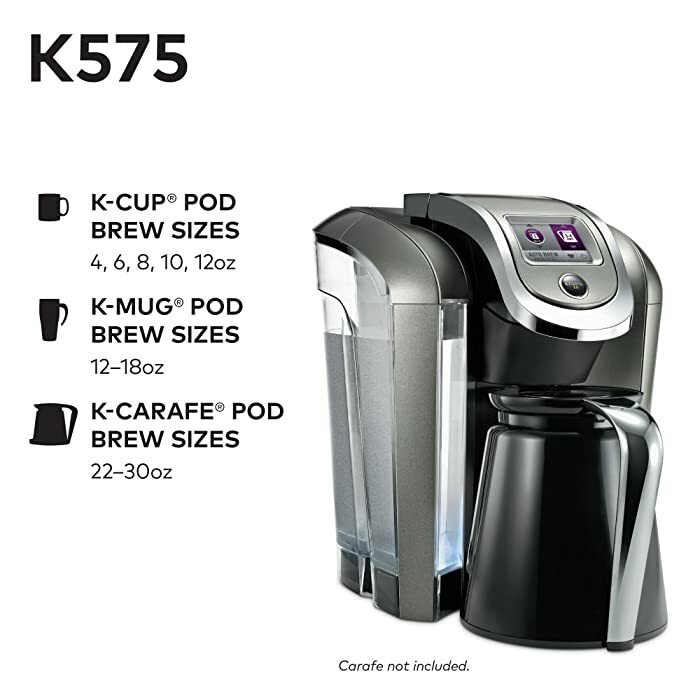 How many different sizes of coffee can you brew with the Keurig K55? There are 3 sizes at your disposal. You can’t use a carafe so you’ll be limited to 6oz, 8oz and 10oz sizings. This is not world-beating but caters for most tastes. How often do I need to descale my machine? You should descale your coffee maker every 3 or 4 months. The interval depends on the mineral content of the water in your area or in the bottled water you choose to use instead. This is a job that demands less than an hour of your time 3 or 4 times a year so don’t skip it. Is descaling an automatic process? There’s some confusion here. Many review sites flag the descaling process as automatic but it does require some manual input. Refer to our detailed breakdown above. This outlines the simple steps you’ll need to follow for effective descaling. Are K-Mug and K-Carafe pods compatible with the Keurig K55 coffee maker? No, you cannot use these with the Keurig K55. It’s not possible to use a carafe either. You can use any type of K-Cup pod regardless of brand though. This should give you more than adequate choice when it comes to your morning caffeine fix. You can also enjoy hot chocolate and iced drinks depending on the pods you select. Can you adjust the temperature of the water for brewing coffee with the K55? No, you can’t fine-tune the temperature. That said, the water heats to the optimum temperature for great coffee anyway so this is no sore loss. How regularly do you need to change the filter? This should be changed every 2 months. There’s a handy warning light to let you know when the time is up so all the guesswork is taken away and there’s no excuse not to use fresh filters. We would advise always having at least one to hand rather than waiting until the light comes on before restocking. Filters are not expensive and you’ll get a much better coffee while prolonging the lifespan of your machine into the bargain if the filters are not worn. Why does the machine not brew after pressing the Brew button? If the lights are not blinking, it’s pointless pressing the Brew button. When you lift then lower the handle, the machine detects that you have added a K-Cup pod. Once it’s lowered again, the lights will blink, you can hit Brew and wait 60 seconds for that coffee to be served. No, it’s not. You’ll be fine if your electricity runs on 110/120 volts. This machine does not work with a 220-volt supply unless you invest in a converter. Since this will involve added expense, you’re better off seeking an alternative coffee machine if you have a 220-volt supply at home. How can you find the serial number of your Keurig K55? The picture below shows the serial number which is found behind the water reservoir on the body of the machine. Is there a storage drawer with the Keurig K55? There is not one supplied although you can easily purchase a third-party drawer to match if you want to keep your K-Cup pods organized. Are there programmable presets on the K55? No. This is a very basic coffee machine so you can’t set the machine to kick in at a preset time. We very much hope you’ve enjoyed this detailed breakdown of the outstanding Keurig K55. Not everyone wants a coffee maker with a display panel like a plane cockpit and a choice of drinks that can be overwhelming. If you’re looking for a no-nonsense and extremely affordable coffee maker from a brand you can trust, the Keurig K55 makes a superb entry point into the world of single serve coffee makers. While the uprated 2.0 series from Keurig certainly have their advantages, going for one of the classic 1.0 machine like the K55 gives you a wider choice when it comes to pods. Without the barcode scanner forcing you to use only Keurig K-Cup pods, you can enjoy the coffee of your choice without feeling restricted. You can even sidestep the pods completely and plump for freshly ground coffee instead. Over the coming months, we’ll be taking delivery of more and more coffee machines. These are not gifted by the manufacturer but paid for ourselves. This allows us to give completely honest reviews without feeling obligated to overlook the negatives since we spent our own money and have no vested interest to distort the truth. But the good news is, with the Keurig K55, aside from the few minor grumbles above, you’ll get a fantastic single serve coffee maker at a price you’ll love. Check one out today! Don’t hesitate to get in touch with any questions or feedback at all. We love to hear from our readers here at Fourth Estate Coffee. If you’re looking for a no-nonsense and extremely affordable coffee maker from a brand you can trust, the Keurig K55 makes a superb entry point into the world of single serve coffee makers. Wow, this is by far one of the most in-depth reviews of Keurig K55. I mean you really went the extra mile to do this review extremely thorough. Excellent job. After reading this review I don’t think anyone would have any questions left in their minds. I guess since you covered everything about keurig k55 no one has anything to say.